© Sannarangappa and Jalleh; Licensee Bentham Open. Inhaled corticosteroids (ICS) have been used as first line treatment of asthma for many decades. ICS are a form of exogenous glucocorticosteroids that can suppress the endogenous production of glucocorticosteroids, a condition known as adrenal suppression (AS). As a result, cessation, decreasing the dose or changing the type of ICS may trigger features of adrenal insufficiency (AI). AI may cause a spectrum of presentations varying from vague symptoms of fatigue to potentially life threatening acute adrenal crises. This article reviews the current literature on ICS and AI particularly in adults (although majority of data available is from the paediatric population). It aims to increase awareness of the potential risk of AI associated with ICS use, delineate the pathogenesis of AI and to provide recommendations on screening and management. From our literature review, we have found numerous case reports that have shown an association between ICS and AI particularly in children and patients using high doses. However, there have also been reports of AI in adults as well as in patients using low to moderate doses of ICS. To conclude, we recommend screening for AI in select patient groups with an initial early morning serum cortisol. If results are abnormal, more definitive testing such as the low dose corticotropin stimulation test may be done to confirm the diagnosis. Keywords: Adrenal insufficiency, adrenal suppression, inhaled corticosteroids..
Asthma is one of the most common chronic conditions in Australia with over 2 million Australians currently diagnosed with asthma . It is a complex disease affecting both adults and children with variable phenotypic expression . Airway inflammation, bronchial hyper-responsiveness and airflow obstruction form the triad of asthma, clinically manifesting as cough, wheezing, breathlessness and chest tightness . Asthma is one of the most common chronic diseases in the world and its incidence has been increasing in the past three decades. It is estimated to affect between 10 -15% of children and adolescents in developed world countries [1, 4-6]. The incidence has been reported to be 1-2% higher in the elderly population . An estimated 300 million people are suffering from asthma with >100 million additions likely by the year 2025 . A systematic review has described the risk of AI with oral glucocorticoid withdrawal . However, few studies have addressed the risk of AI with inhaled glucocorticoids. Glucocorticosteroids have been used in the treatment of asthma since 1956 due to their broad anti-inflammatory and immunosuppressive effects . ICS have been shown to significantly reduce airway hyper-responsiveness, decrease the severity of symptoms, improve lung function and prevent acute exacerbations leading to a decrease in morbidity and mortality in asthma [10-13]. Many asthma management guidelines recommend ICS as the first line therapy at low doses in mild persistent asthma. They are also preferred therapy at a moderate doses along with long acting beta 2- agonists for moderate asthma . Higher doses are used only if symptoms persist despite the above combination therapy . ICS are also used in over 70% COPD patients but the benefits are controversial as they reduce exacerbation by 20-25% in severe disease. Long-term treatment with ICS added to long-acting bronchodilators is recommended only for patients at high risk of exacerbations (FEV1<50% and who have 2 or more acute exacerbations in one year). Long-term monotherapy with oral or ICS is not recommended in COPD [14, 15]. Adrenal insufficiency (AI) is a life-threatening disorder that can result from primary adrenal failure or secondary adrenal disease due to impairment of the hypothalamic–pituitary-adrenal (HPA) axis [16-18]. It results from either deficiency or impaired action of glucocorticoids. Typical symptoms of AI include weakness, fatigue, anorexia, abdominal pain, weight loss and salt craving. Characteristic hyperpigmentation of the skin and orthostatic hypotension does not occur in secondary AI [19, 20]. ICS are assumed to be safer due to less systemic absorption and less than 500 mcg/day of fluticasone propionate or equivalent dose is reported to be safe. However, Schwartz et al.,  reported in 2012 that 14 (children) of the 93 cases (including their own reported case) of symptomatic AI that were reported in PubMed were in fact using a moderate dose of 500 mcg or less/day of fluticasone propionate. They also for the first time recommended that pre-adolescent children who are receiving 400 mcg or more of fluticasone propionate or equivalent dose/day should get quarterly tests for early morning cortisol levels and that physicians, patients and family should be educated to anticipate and manage AI during periods of serious physiological stress . The effects of AI may vary from non-specific complaints of fatigue that may go undetected without a high level of clinical suspicion to severe adrenal crises with hypotension and hypoglycaemia . We did a literature search using PubMed to review the prevalence, aetiopathogenesis, available diagnostic tests to assess the risk in patients and guidelines with regards to managing this condition. From the review of available literature, the majority of evidence is based on case reports. In total, there were 57 reports of acute adrenal crises secondary to use of ICS presenting with nausea, vomiting, hypovolaemia and/or hypoglycaemia [22-34]. Combining the various studies, there was evidence of HPA axis suppression in a total of 590 secondary to use of ICS from a variety of methods used to assess the degree of adrenal suppression [21-39]. There are few studies investigating the risk of AI in adults. However, six case reports have identified a link between ICS and AI. In the first case report, a 76 year old male presented with acute AI that was attributed to long term use of 500 μg fluticasone daily . In the second report, a 38 year old male on high dose budesonide, developed symptoms of AI after decreasing his budesonide dose from 3.2 mg daily to 2.4 mg daily. This was confirmed by the short tetracosactrin test to be due to adrenal suppression . A similar occurrence was reported in the third report, a 55 year old female who developed features of AI whilst being tapered from ICS . In the fourth case report, a 33 year old male presented with acute AI after changing his high dose fluticasone regime of 1000-2000 μg fluticasone daily to 800 μg budesonide daily . The 5th case was of a 54 year old woman with severe, poorly controlled asthma using inhaled triamcinolone and fluticasone . While no clinical symptoms were reported, she was found to have a low fasting morning serum cortisol suggesting she would be at risk of significant systemic symptoms if her ICS were withheld . Finally, the most recent report was of a 55 year old female using <500 μg fluticasone daily who had vague symptoms of fatigue and weight gain that was confirmed by two cosyntropin stimulation tests to be due to adrenal suppression . In addition to these case reports, a survey by Todd et al.,  identified 5 further cases of AI in adults secondary to ICS. In addition, a study by Fardon et al., with 21 adult volunteers, showed a decrease in urinary cortisol in patients who took ICS such as fluticasone or mometasone . While measurement of urinary free cortisol is a suboptimal method of assessing AI , this article raises the concern that ICS other than fluticasone such as mometasone may also be implicated in AS. A large case control study by Lapi et al.,  analysed databases in Quebec for cases of AI in patients using ICS. It showed the incidence of AI to be 1.1 per 10,000 person-years at risk. The other significant finding of this study was patients using ≥1000 μg daily of fluticasone were at the highest risk of developing AI . A Cohort study by Smith et al.,  determined the prevalence of HPA axis suppression to be 9.3% from a cohort of 214 children using ICS. Key points from the study included the fact that children on low to moderate doses of ICS were still at risk of HPA axis suppression. Furthermore, no clinical factors were found to be able to predict HPA axis suppression . Based on the above studies, AI related to ICS use has been reported in a variety of age groups. The majority of reports involved high dose fluticasone. However, other ICS such as mometasone may also be associated with AS and low dose fluticasone was also reported to cause AS [21, 30, 40]. Additionally, changing the type of ICS or reducing the dose could potentially trigger AI [26-28, 38]. Given the multiple case reports, AI is a real risk that needs to be considered when commencing patients on ICS, particularly if high doses are required. Notably, AI secondary to ICS has been implicated in two deaths [32, 34]. Corticotropin releasing hormone (CRH) is produced by the hypothalamus and is released into the median eminence. This, in turn, stimulates synthesis and processing of proopiomelanocortin (POMC). This results in releasing of POMC peptides including adrenocorticotrophic hormone (ACTH) from anterior pituitary gland. ACTH binds to the melanocortin-2 receptor in the adrenal gland and stimulates synthesis and release of cortisol in to the systemic circulation. This cortisol in turn exerts a negative feedback inhibition of CRH and ACTH release. This classic example of negative feedback hormone regulation is referred to as the HPA axis . The circulating serum cortisol as lipids, readily crosses the plasma membrane of the target cell in to the cytoplasm, where they bind to cytoplasmic/nuclear glucocorticoid receptor (GR). The binding of steroid to the GRα in the cytosol results in activation of the steroid-receptor complex. Following translocation to the nucleus, gene transcription is stimulated or repressed after binding of the dimerized GR-ligand complex to a specific DNA sequence in the promoter regions of target genes [43, 44]. This promotes synthesis of anti-inflammatory proteins (transactivation) and inhibits synthesis of proinflammatory cytokines (transrepression) . AS is the most common cause of AI, which results from exposure of the HPA axis to exogenous glucocorticoids (Fig. 1 ). This is a well-recognized complication of most forms of steroid therapy (e.g., oral, inhaled, parenteral, intranasal). This effect can persist up to one year after cessation of steroid therapy [47, 48]. HPA axis response to acute and chronic stress leading from inflammation. CRH-corticotrophin releasing hormone, ACTHadrenocorticotrophic releasing hormone, IL-interleukin, TNF-tumor necrosis factor. Green arrows indicate activation, red arrows indicate suppression. HPA axis gets activated by specific cytokines released during inflammation (IL-1, IL6). IL-6 has been recognized as important in innate immune response . 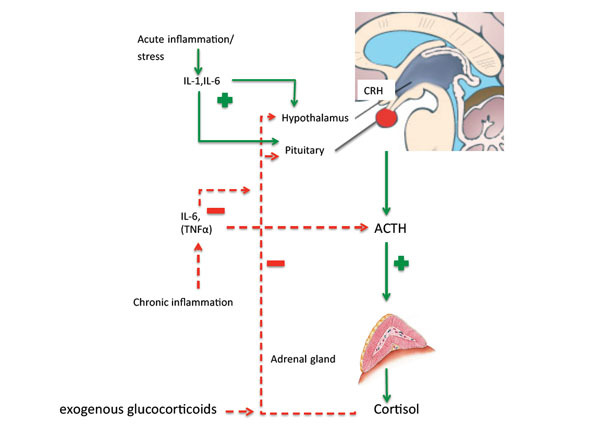 Acute inflammation leads to activation of HPA axis and marked and prolonged elevation of plasma ACTH and cortisol, however chronic activation of HPA axis leads to a blunted ACTH and cortisol response as a protective adaptation mechanism . Exogenous corticosteroids lead to suppression of the HPA axis in the same manner as cortisol that inhibits both CRH and ACTH synthesis . In a review article Priftis et al.,  have explained how chronic inflammatory conditions might be linked to HPA axis hypo-responsiveness through inhibition of ACTH induced cortisol production. They further reported that chronic allergic diseases might be associated with reduced activity and/or responsiveness of HPA axis to both inflammation and acute stress. While the majority of the asthma patients who are on ICS show an improvement in adrenal function, a subgroup shows mild AS. This variation might be influenced by individual variation in sensitivity of glucocorticoid receptors (GR) to exogenous steroids. This response might be genetically predetermined [50-52]. This has been further supported by Rajagopala et al.,  who have shown an impaired response to 1 microgram cosyntropin test in 40 patients with bronchiectasis, compared to 40 controls. This was not associated with the use of inhaled steroids or severity of the disease. The HPA axis is under circadian regulation with peak ACTH release at 6 am to 8 am [54, 55]. This circadian rhythm measured as salivary cortisol, in infants born to mother/father with allergy or asthma was associated with a flattened response . Various ICS are used in the management of asthma and COPD. They are believed to be of similar efficacy when used in equivalent doses. But there is a significant difference in their pharmacodynamics and pharmacokinetics that might impact their safety profile. This has been very well explained by Ahmet et al., in their review article in 2011 . The parameters that contribute towards the safety profile of the inhaled steroids include oral bioavailability, lung deposition, protein binding, half-life and systemic clearance. These parameters vary significantly among the commonly used inhaled steroids (budesonide, ciclesonide, fluticasone propionate). Fluticasone is most commonly associated with AS reported in literature , mostly when used at higher then recommended dosages especially in paediatric patients. A systemic review by Lipworth  concluded that fluticasone exhibited a greater dose dependent effect on adrenal suppression compared with other ICS. This is likely due to pharmacokinetic properties of fluticasone including its long half-life and high lipophilicity resulting in greater systemic retention [42, 57]. Although ciclesonide has been reported to have a better safety profile, recently two cases with HPA axis suppression associated with ciclesonide have been reported . Weiner P et al.,  in their study have shown an inverse correlation between the degree of airway obstruction and nocturnal cortisol secretion, single dose of 500 mcg of ICS (fluticasone propionate) at 8 pm was associated with a 29.4% decrease in the total nocturnal cortisol production. More severe nocturnal cortisol decrease was associated with less obstructed airway patients (FEV1) . Drug interaction can be other key factor in ICS associated AS; CYP3A4 liver enzyme inhibitors such as ritonavir and ketoconazole, significantly increase the plasma concentration of ICS (up to four fold). This can lead to Cushing’s syndrome and AS. Healthcare providers must always weigh the risk and benefits while using ICS and CYP3A4 inhibitors concomitantly . These above findings suggest that AI secondary to ICS is due to a number of mechanisms. Firstly, subgroups of these patients have a genetically predetermined propensity to develop AS. Secondly, the underlying chronic disease for which they are on these inhaled steroids it-self has varying effect on HPA axis response. Thirdly, the variable safety profile of the inhaled steroid (and other concomitant drugs) that is used has an impact on HPA axis. Finally, there is a dose dependent AS in these patients. Clinical features of this “master of disguise” condition is highly variable. These, often, include non-specific symptoms like fatigue, weakness, malaise, nausea, abdominal pain, myalgia, dizziness, poor weight gain and headache. Although growth suppression may be associated with AS, this is neither a sensitive nor specific indicator of AS, as it can be purely due to the chronic disease condition itself . Hyperkalaemia and hyperpigmentation - features that are associated with primary AI are not present with AS. On the other hand, hyponatraemia may be present secondary to inappropriate arginine vasopressin release and hypoglycaemia is a common feature especially in paediatric and adolescent patients . This condition can go unrecognized until a physiological stress (surgery, trauma, inter-current illness) precipitates an acute crisis. Symptoms of this acute crisis vary from hypotension, vomiting, hypovolaemic shock, unexplained hypoglycaemia, seizures, decreased level of consciousness, coma and even death [32, 41, 57, 62]. A high index of suspicion by the treating clinicians, educating patients and their families to anticipate these symptoms are paramount in preventing this potentially life threatening condition. Irrespective of the cause, the diagnosis of AI depends on the demonstration that cortisol secretion is inappropriately low . All the current tests measure total cortisol concentration that is closely related to free biologically active cortisol except in a few situations . Oral contraceptive pills and pregnancy can lead to false positive results, while low concentrations of cortisol-binding globulin (e.g. cirrhosis) leads to false negative results [64, 65]. The insulin tolerance test has long been considered gold standard in measuring AI. It investigates the integrity of HPA axis and is especially useful in patients with suspected recent corticotropin deficiency. However this is not considered to be safe in children, in patients with cardiovascular disease and in patients who are prone to seizures. It is also not easy to perform when compared with other tests [66, 67]. CRH (corticotropin-releasing hormone) tests are used mainly to differentiate between secondary and tertiary AI. This distinction is seldom useful in terms of treatment. Serum concentration of DHEA-S (dehydroepiandrosterone and its sulphate) are low in patients with primary or central AI. Urinary free cortisol measurement is considered not useful in AI . A baseline serum ACTH concentration should be measured to rule out AI secondary to low ACTH concentration. If ACTH concentration is low, a thorough clinical examination including visual fields examination and measurement of other pituitary hormones is important to exclude a pituitary adenoma (most commonly a non-functioning adenoma). An 8 am serum cortisol concentration of<100 nmol/L is strongly suggestive of AI and is considered as a reasonable first step in identifying the suspected AI and also screening of children on ICS therapy at risk of AS. A serum cortisol concentration of >500 nmol/L at 8 am excludes secondary AI . Higher cut off values for identifying AI has been used in some studies. Smith et al.,  used a cut off value of 170 nmol/L for screening at risk children on ICS and found out that, out of the 43 children who had AI based on screening 20 were confirmed with AS with low dose (1 mcg) ACTH stimulation test (45.6%). Both standard dose and low dose ACTH stimulation tests are being used in identifying AI; although recently, the low dose ACTH stimulation test has been preferred method among some endocrinologists, there is no consensus as to which one is better and as such we support either of the above tests (whichever is locally available) [67, 68]. In the ACTH stimulation test, a set quantity of corticotropin is administered intravenously or intramuscularly (250 mcg with standard dose test and 1 mcg with low dose test) and serum cortisol concentrations are measured at baseline, 30 minutes and 60 minutes after the stimulation. A peak concentration of >500 nmol/L (some laboratories use a lower cut of value and this should be considered and confirmed with local assay providers) would exclude AI, a concentration <500 would be diagnostic of AI, with both sensitivity and specificity close 90% [41, 67]. It is important to note that none of the above mentioned tests can correctly identify all the patients with AI, therefore if there is a strong clinical suspicion of the AI those patients should be promptly reassessed . We support an 8 am morning serum cortisol measurement as the initial first step in assessment of AI; if abnormal (serum cortisol concentration of <100 nmol/L) this can be confirmed with either a standard 250 mcg ACTH stimulation test or 1 mcg ACTH stimulation test. In addition, we recommend one of these confirmatory test on patients who have clinical symptoms of AS even if their 8 am morning cortisol concentration is > 100 mmol/L because 8 am morning serum cortisol concentration screening test has a low sensitivity of only around 60% [57, 69]. AI, irrespective of the cause is one of the acute life threatening emergencies in both adult and paediatric patients. Clinicians need to be aware that this can happen in patients treated with ICS with unusual symptoms so as to manage them in a timely manner . An endocrinologist should be involved in managing AS . Management of AI involves, managing acute adrenal crisis, management of AI during physiological stress, patient education and information regarding medical alert bracelets. An acute adrenal crisis needs urgent rehydration with intravenous normal saline and replacement of glucocorticoids in the form of hydrocortisone 100 mg immediately followed by 50-100 mg IV/IM (intravenous/intramuscular) every 6 hours (depending on body surface area and age) . AS associated with ICS may go unrecognized until a physiological stress results in adrenal crisis . During minor illness or surgical procedures up to three times the physiological dose of corticosteroid replacement may be needed to compensate for lack of appropriate adrenal response to stress due to AS. This replacement dose requirement might be as high as 10 times the physiological dose during major illness/surgery . Therefore patients should be cautioned about abrupt withdrawal of ICS after prolonged use especially if using a higher dose of ICS [22, 23]. Patients and their family should be educated about symptoms of AI (myalgia, lack of energy, weight loss, nausea, dizziness) and to seek immediate medical advice. Patients who are at risk of AS should carry medical alert bracelets [41, 57]. HPA axis has a varied response to ICS in asthma patients. This appears to be due to varying HPA axis stress-immune response, which might be genetically predetermined. Generally in the vast majority of the patients use of ICS has a favorable response and regular use has been shown to improve lung function, quality of life, prevent hospitalization/exacerbations and reduce asthma related mortality. However in a minority of patients there is an attenuated response resulting in AS that may go unrecognized until a physiological stress induced adrenal crisis, with severe morbidity rarely resulting in death [32, 34, 49, 57]. Australian and Canadian ICS dosing guidelines suggest 100-250 mcg/day of fluticasone or equivalent in children [33, 70]. In adults and adolescents (>12 years) using fluticasone propionate, maximal efficacy was achieved at a dose of 500 mcg/day. Of this, 90% of the benefit was achieved at doses of 100 to 250 mcg/day [21, 71]. Therefore, it is important to use the minimal required dose to achieve symptom control and if a higher dose is used it should be reduced as soon as possible . In the case of COPD patients who are on ICS, a total daily dose of ICS ≥1000 mcg of fluticasone propionate appears to be associated with higher risk of AS. But the data in this regard is scant and treating physicians should keep an open mind to screen any COPD patients who are an more than 400 mcg/day of fluticasone propionate or its equivalent dosage, the risk of AS appears to be greater in COPD patients who are exposed to the highest dose of ICS than those with asthma . Finally any patient who is on inhaled corticosteroids should be screened for AS if they have any signs or symptoms of AS regardless of the dosage. There is no published data on management of this AS associated with ICS. All the recommendations have been based on best available literature and expert opinion. The key features of management would involve prevention, screening and managing AS. Ahmet et al.,  and Schwartz et al.,  in their review article have explained and given some insight to these key points. It is advisable to screen all the patients who are at risk (Tables 1-3) [21, 57]. As there are no specific symptoms that can predict ICS associated AS , any symptom of AI and any clinical scenario that could precipitate adrenal crisis in someone with AI should be an indication for screening for AS. Although there is no test that can identify AS with certainty, an 8 am morning serum cortisol concentration followed by 1 mcg or 250 mcg ACTH stimulation test if required is most practical way to identify AS in these patients . Prompt management of AS with active involvement of an endocrinologist is essential in case of adrenal crisis; rehydration and intravenous hydrocortisone is mainstay of managing this condition in acute setting. Summary of number of cases. Patients who are at risk of AS and would benefit from screening for AS. 10 Heat stress, any other condition where AI might result in acute adrenal crisis. ICS therapy is essential in the treatment of asthma and in certain COPD patients with vast proven benefits both in morbidity and mortality, in adults and children alike. ICS is associated with AS in a minority of patients who are on ICS for their respiratory conditions with potential serious consequences, especially in a physiologically stressful condition. Treating clinicians, patients and their family need to be watchful of the serious, yet non-specific symptoms, so as to appropriately identify and manage this potential life threatening condition. Use of ICS at minimal recommended dosing with increasing dose only if required is helpful in preventing this complication. A robust clinician-patient involvement in educating, recognising, screening and regular follow up will certainly help in reducing this complication. More research needs to be undertaken especially in the older adults and elderly population who are using ICS for COPD management, and it appears that COPD patients who are using ICS are in fact at a greater risk of AS. Mackie AE, McDowall JE, Ventresca P, Bye A, Falcoz C, Daley-Yates PT. Systemic exposure to fluticasone propionate adminis-tered via metered-dose inhaler containing chlorofluorocarbon or hydrofluoroalkane propellant. Clin Pharmacokinet 2000; 39 (Suppl 1 ): 17-22. National Institutes of Health.Global initiative for asthma global strategy for asthma management and prevention. Available from: http://wwwginasthmacom/Guideli neitem asp? ?l1=2&l2=1&omt 2004; [cited 7th July 2014]: . Martin E. The CGHA asthma management program and its effect upon pediatric asthma admission rates. Clin Pediatr (Phila) 2001; 40(8): 425-34. Kozyrskyj AL, Hildes-Ripstein GE. Assessing health status in Manitoba children: acute and chronic conditions. Can J Public Health 2002; 93(Suppl 2 ): S44-9. Masoli M, Fabian D, Holt S, Beasley R. The global burden of asthma: executive summary of the GINA Dissemination Committee report. Allergy 2004; 59(5): 469-78. Richter B, Neises G, Clar C. Glucocorticoid withdrawal schemes in chronic medical disorders. A systematic review Endocrinol Metab Clin North Am 2002; 31(3): 751-8. CONTROLLED trial of effects of cortisone acetate in status asthmaticus; report to the Medical Research Council by the subcommittee on clinical trials in asthma. Lancet 1956; 271(6947): 803-6. Georgitis JW. The 1997 Asthma Management Guidelines and therapeutic issues relating to the treatment of asthma. National Heart Lung and Blood Institute Chest 1999; 115(1): 210-7. Expert Panel Report 3 (EPR-3) Guidelines for the diagnosis and management of asthma-summary report 2007. J Allergy Clin Immunol 2007; 120(5)(Suppl ): S94-138. Kelly HW, Nelson HS. Potential adverse effects of the inhaled corticosteroids. J Allergy Clin Immunol 2003; 112(3): 469-78 quiz 79. Adams NP, Bestall JC, Jones P, Lasserson TJ, Griffiths B, Cates CJ. Fluticasone at different doses for chronic asthma in adults and children. Cochrane Database Syst Rev 2008; (4): CD003534. Vestbo J, Hurd SS, Agusti AG , et al. Global strategy for the diagnosis, management, and prevention of chronic obstructive pulmonary disease: GOLD executive summary. Am J Respir Crit Care Med 2013; 187(4): 347-65. Barnes PJ. Inhaled corticosteroids in COPD a controversy. Respiration 2010; 80(2): 89-95. Arlt W, Allolio B. Adrenal insufficiency. Lancet 2003; 361(9372): 1881-93. Bornstein SR. Predisposing factors for adrenal insufficiency. N Engl J Med 2009; 360(22): 2328-39. Neary N, Nieman L. Adrenal insufficiency: etiology, diagnosis and treatment. Curr Opin Endocrinol Diabetes Obes 2010; 17(3): 217-3. Lovas K, Husebye ES. Addison's disease. Lancet 2005; 11-17; 365(9476): 2058-61. Addison T, Ed. On the constitutional and local effects of disease of the supra-renal capsules. London: Samuel Highley. 1855. Schwartz RH, Neacsu O, Ascher DP, Alpan O. Moderate dose inhaled corticosteroid-induced symptomatic adrenal suppression: case report and review of the literature. Clin Pediatr (Phila) 2012; 51(12): 1184-90. Macdessi JS, Randell TL, Donaghue KC, Ambler GR, van Asperen PP, Mellis CM. Adrenal crises in children treated with high-dose inhaled corticosteroids for asthma. Med J Aust 2003; 178(5): 214-6. Patel L, Wales JK, Kibirige MS, Massarano AA, Couriel JM, Clayton PE. Symptomatic adrenal insufficiency during inhaled corticosteroid treatment. Arch Dis Child 2001; 85(4): 330-4. Drake AJ, Howells RJ, Shield JP, Prendiville A, Ward PS, Crowne EC. Symptomatic adrenal insufficiency presenting with hypoglycaemia in children with asthma receiving high dose inhaled fluticasone propionate. BMJ 2002; 324(7345): 1081-2. Todd GR, Acerini CL, Buck JJ , et al. Acute adrenal crisis in asthmatics treated with high-dose fluticasone propionate. Eur Respir J 2002; 19(6): 1207-9. Todd GR, Wright D, Ryan M. Acute adrenal insufficiency in a patient with asthma after changing from fluticasone propionate to budesonide. J Allergy Clin Immunol 1999; 103(5 Pt 1): 956-7. Dunlop KA, Carson DJ, Shields MD. Hypoglycemia due to adrenal suppression secondary to high-dose nebulized corticosteroid. Pediatr Pulmonol 2002; 34(1): 85-6. Duplantier JE, Nelson RP Jr, Morelli AR, Good RA, Kornfeld SJ. Hypothalamic-pituitary-adrenal axis suppression associated with the use of inhaled fluticasone propionate. J Allergy Clin Immunol 1998; 102(4 Pt 1): 699-700. Hay CM, Spratt DI. Adrenal insufficiency in a woman secondary to standard-dose inhaled fluticasone propionate therapy. Endocrinol Diabetes Metab Case Rep 2014; 2014: 130080. Albert SG, Slavin RG. Adrenal insufficiency in an adult on inhaled corticosteroids; recovery of adrenal function with inhaled nedocromil sodium. Ann Allergy Asthma Immunol 1998; 81(6): 582-4. Donaldson MD, Morrison C, Lees C , et al. Fatal and near-fatal encephalopathy with hyponatraemia in two siblings with fluticasone-induced adrenal suppression. Acta Paediatr 2007; 96(5): 769-2. ADRAC Fluticasone and adrenal crisis. In: Aust Adv Drug React Bull. 2003; 22: p. 2. Todd GR, Acerini CL, Ross-Russell R, Zahra S, Warner JT, McCance D. Survey of adrenal crisis associated with inhaled corticosteroids in the United Kingdom. Arch Dis Child 2002; 87(6): 457-61. Zollner EW, Lombard CJ, Galal U, Hough FS, Irusen EM, Weinberg E. Hypothalamic-pituitary-adrenal axis suppression in asthmatic school children. Pediatrics 2012; 130(6): e1512-9. Smith RW, Downey K, Gordon M , et al. Prevalence of hypothalamic-pituitary-adrenal axis suppression in children treated for asthma with inhaled corticosteroid. Paediatr Child Health 2012; 17(5): e34-9. Lapi F, Kezouh A, Suissa S, Ernst P. The use of inhaled corticosteroids and the risk of adrenal insufficiency. Eur Respir J 2013; 42(1): 79-86. Wong J, Black P. Acute adrenal insufficiency associated with high dose inhaled steroids. BMJ 1992; 304(6839): 1415. Samaras N, Schneider A, Frangos E, Forster A, Samaras D. A rare case of adrenal insufficiency induced by inhaled corticosteroids. J Am Geriatr Soc 2013; 61(5): 841-2. Fardon TC, Lee DK, Haggart K, McFarlane LC, Lipworth BJ. Adrenal suppression with dry powder formulations of fluticasone propionate and mometasone furoate. Am J Respir Crit Care Med 2004; 170(9): 960-6. Charmandari E, Nicolaides NC, Chrousos GP. Adrenal insufficiency. Lancet 2014; 383(9935): 2152-67. Lipworth BJ. Systemic adverse effects of inhaled corticosteroid therapy: A systematic review and meta-analysis. Arch Intern Med 1999; 159(9): 941-55. Molina PE, Ed. Endocrine physiology. In: chaper 6 adrenal gland New Orleans McGraw Hill. Beato M, Sanchez-Pacheco A. Interaction of steroid hormone receptors with the transcription initiation complex. Endocr Rev 1996; 17(6): 587-609. Barnes PJ. Glucocorticosteroids: current and future directions. Br J Pharmacol 2011; 163(1): 29-43. Fauci AS, Braunwald E, Kasper DL , Eds. Harrison’s principles of internal medicine. New York: McGraw-Hill. 2008; 17th ed. Heller MK, Laks J, Kovesi TA, Ahmet A. Reversal of adrenal suppression with ciclesonide. J Asthma 2010; 47(3): 337-9. Goldbloom E, Ahmet A. Adrenal suppression: An under-recognized complication of a common therapy. Paediatr Child Health 2010; 15(7): 411-2. Priftis KN, Papadimitriou A, Nicolaidou P, Chrousos GP. The hypothalamic-pituitary-adrenal axis in asthmatic children. Trends Endocrinol Metab 2008; 19(1): 32-8. Tantisira KG, Lake S, Silverman ES , et al. Corticosteroid pharmacogenetics: association of sequence variants in CRHR1 with improved lung function in asthmatics treated with inhaled corticosteroids. Hum Mol Genet 2004; 13(13): 1353-9. Slawik M, Reisch N, Zwermann O , et al. Characterization of an adrenocorticotropin (ACTH) receptor promoter polymorphism leading to decreased adrenal responsiveness to ACTH. J Clin Endocrinol Metab 2004; 89(7): 3131-7. Buemann B, Vohl MC, Chagnon M , et al. Abdominal visceral fat is associated with a BclI restriction fragment length polymorphism at the glucocorticoid receptor gene locus. Obes Res 1997; 5(3): 186-92. Rajagopala S, Ramakrishnan A, Bantwal G , et al. Adrenal insufficiency in patients with stable non-cystic fibrosis bronchiectasis. Indian J Med Res 2014; 139(3): 393-401. Veldhuis JD, Iranmanesh A, Johnson ML, Lizarralde G. Amplitude, but not frequency, modulation of adrenocorticotropin secretory bursts gives rise to the nyctohemeral rhythm of the corticotropic axis in man. J Clin Endocrinol Metab 1990; 71(2): 452-63. Horrocks PM, Jones AF, Ratcliffe WA , et al. Patterns of ACTH and cortisol pulsatility over twenty-four hours in normal males and females. Clin Endocrinol (Oxf) 1990; 32(1): 127-34. Ball TM, Anderson D, Minto J, Halonen M. Cortisol circadian rhythms and stress responses in infants at risk of allergic disease. J Allergy Clin Immunol 2006; 117(2): 306-11. Ahmet A, Kim H, Spier S. Adrenal suppression: a practical guide to the screening and management of this under-recognized complication of inhaled corticosteroid therapy. Allergy Asthma Clin Immunol 2011; 7: 13. Weiner P, Berar-Yanay N, Davidovich A, Magadle R. Nocturnal cortisol secretion in asthmatic patients after inhalation of fluticasone propionate. Chest 1999; 116(4): 931-4. Doganci A, Sauer K, Karwot R, Finotto S. Pathological role of IL-6 in the experimental allergic bronchial asthma in mice. Clin Rev Allergy Immunol 2005; 28(3): 257-70. Mastorakos G, Chrousos GP, Weber JS. Recombinant interleukin-6 activates the hypothalamic-pituitary-adrenal axis in humans. J Clin Endocrinol Metab 1993; 77(6): 1690-4. Bantle J, Ercan-Fang N, Niewoehner C, Eds. The adrenal cortex. Endocrine pathophysiology Raleigh: Hayes Barton Press. 2004; 2nd ed: pp. pp. 84-108. Miller W, Achermann J, Frankland AW, Sperling M, Eds. The adrenal cortex and its disorders. Pediatric endocrinology Philadelphia: Saunders. 2008; 3rd ed: pp. pp. 444-511. Christ-Crain M, Jutla S, Widmer I , et al. Measurement of serum free cortisol shows discordant responsivity to stress and dynamic evaluation. J Clin Endocrinol Metab 2007; 92(5): 1729-35. Klose M, Lange M, Rasmussen AK. Factors influencing the adrenocorticotropin test: role of contemporary cortisol assays, body composition, and oral contraceptive agents. J Clin Endocrinol Metab 2007; 92(4): 1326-33. Tan T, Chang L, Woodward A , et al. Characterising adrenal function using directly measured plasma free cortisol in stable severe liver disease. J Hepatol 2010; 53(5): 841-. Chrousos GP, Kino T, Charmandari E. Evaluation of the hypothalamic-pituitary-adrenal axis function in childhood and adolescence. Neuroimmunomodulation 2009; 16(5): 272-83. Grossman AB. Clinical Review: The diagnosis and management of central hypoadrenalism. J Clin Endocrinol Metab 2010; 95(11): 4855-63. Kazlauskaite R, Evans AT, Villabona CV , et al. Corticotropin tests for hypothalamic-pituitary- adrenal insufficiency: a meta analysis. J Clin Endocrinol Metab 2008; 93(11): 4245-53. Erturk E, Jaffe CA, Barkan AL. Evaluation of the integrity of the hypothalamic-pituitary-adrenal axis by insulin hypoglycemia test. J Clin Endocrinol Metab 1998; 83(7): 2350-4. Kovesi T, Schuh S, Spier S , et al. Achieving control of asthma in preschoolers. CMAJ 2010; 182(4): E172-83. Holt S, Suder A, Weatherall M, Cheng S, Shirtcliffe P, Beasley R. Dose-response relation of inhaled fluticasone propionate in adolescents and adults with asthma: meta-analysis. BMJ 2001; 323(7307): 253-6.